Singapore’s industrial production started 2019 on a disappointing note and contracted 3.1% in January, the first negative print since December 2017. According to Maybank Kim Eng, the contraction was led by electronics (27% share of total IP) and precision engineering (14% share), which offset growth in the rest of the clusters. Electronics fell by a steeper -13.7% (vs. -11.5% in December) with declines across nearly all the segments: semiconductors (-14%), computer peripherals (-15%), infocomms & consumer electronics (-20%) and data storage (-6.7%). Precision engineering (-16% vs. - 7% in December), which trends closely with electronics as it is the “essential ingredient” for producing semiconductor chips, extended its decline. “We expect these two clusters to continue declining in the first half of 2019, coming off from the high base in 2018,” said Maybank KE analyst Chua Hak Bin. Meanwhile, transport engineering continued its double-digit growth with increases in marine & offshore (+27%), aerospace (+17%) and land (+5.3%). “The recovery may however not last, as lower oil prices impact capex,” Chua said. 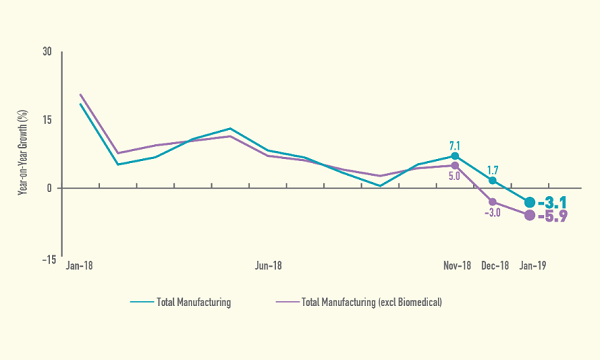 Biomedical manufacturing softened to +10% (vs. +30% in December) as pharma (+13% vs. +41% in December) also eased. General manufacturing (+3.2%) rebounded on the back of miscellaneous industries (+5.8%) and food, beverages & tobacco (+4.6%). Chemicals (+2%) recovered mainly on other chemicals (+18%) due to higher production of fragrances. Three factors could have contributed to the contraction in industrial production, Gan noted. “Firstly, a high base effect in January 2018 (+18.4% YoY, the strongest since August 2017) is observed. Secondly, the relatively weaker external environment seen in Asia (and Singapore) would have discouraged manufacturing activities given the external oriented nature of the regional economies. Lastly, the ongoing uncertainties in the US-Sino trade tensions and the fading technology boom would likely persist into 1H2019. Importantly, these factors are exogenous in nature, and appeared to have dragged both manufacturing and trade activities in key Asian economies,” he said. “Downside risks remains as our revised GDP forecast of 1.8% is predicated on a US-China trade deal which will help revive investment and exports in the second half. A protracted manufacturing recession and a further growth downgrade cannot be ruled out if no trade deal is reached. Trade-related services, such as wholesale trade and transport & storage, will likely mirror the manufacturing slump,” the analyst concluded.